May 3, 2018 by Ecommerce News. About Statistics with tags The United Kingdom. 14726 views. The business-to-consumer ecommerce turnover in the United Kingdom has increased to 13.7 billion pounds, 15.6 billion euros, last year. This is a 13.65 percent increase and for next year, a growth rate of 14.3 percent is predicted, which means ecommerce in the UK could be worth 17.8 billion euros. This is shown by a report from the Ecommerce Foundation. This study also reveals that 16.4 percent of total retail sales comes from the internet, compared to a 14.7 percent share in 2016. 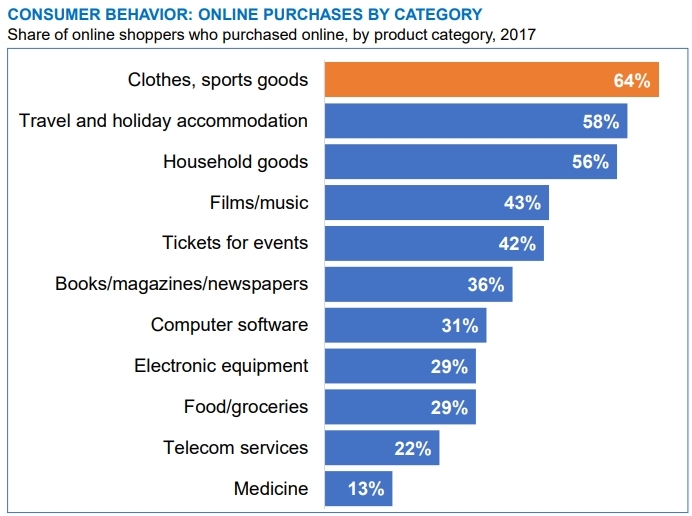 Clothing is still the top choice when it comes to online shopping in the UK, while holiday accommodations rank second. cost play a large role”, the organization writes. Almost half of online consumers in the UK use their mobile phone or tablet to search for products and then use their desktop to place the order. When online shoppers buy something online, 93 percent of them do this at an UK retailer, while 31 percent chooses retailers from other countries in the EU.